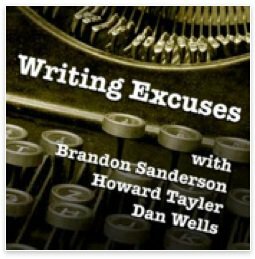 If you are interested in writing, you need to be listening to this podcast. It’s not rude, it’s simply true. Why? The advice from the hosts and special guests is top-notch. It will give you a good idea of what to expect in the industry. By listening weekly, you will keep yourself encouraged. It is 15 minutes long and fits into most commutes, lunch breaks, etc. I use Writing Excuses as a great way to get myself going on Monday Mornings. I generally have a really hard time getting myself up on Mondays, especially on those mornings where I can’t focus and my bones are creaking. The most valuable thing I get from listening weekly is not just advice or encouragement, but the fact that it keeps writing fresh on the mind. If you want to succeed at something, you need to surround yourself with it. You need to be in that world, hanging out with other people in it, talking to people who are successful in it, working with others who are working to succeed as well. Isolation is the dream killer. Writing Excuses is an excellent first step into breaking that isolation.